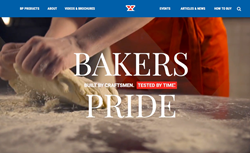 Bakers Pride, known across the culinary industry for high-quality, commercial baking and broiling equipment, announced today the launch of its refreshed and expanded website at http://www.bakerspride.com. The clean, image-rich site was designed with the customer in mind ― with high-impact graphics, intuitive navigation menus, useful product content, and the most current market information. Bakers Pride offers cooking equipment for a broad commercial market. Priced competitively, Bakers Pride deck ovens are known as industry leaders in durability and reliability. Visit the website to review detailed product information ― and sign up for notices of special offers, news, and events.